I’m going to start sharing links to articles about Bengal Cats that I think are really interesting and informative. This article is about “outcrossing”, or introducing a cat to a breeding program that is not of the same breed in order to increase genetic diversity and overall health in your lines, as well as bringing in other desired features. Article by Robyn and Jon Patterson of Quality Bengals. Bengal Cats accepted for championship in CFA! Comments Off on Bengal Cats accepted for championship in CFA! As of Feb 3, 2018, Bengal Cats have finally been accept by the Cat Fanciers Association for championship status. You can find the webpage for Bengals in CFA here. Longhair Bengals now accepted for Championship status in TICA! Comments Off on Longhair Bengals now accepted for Championship status in TICA! The Bengal Cat breed standard in The International Cat Association has always called for shorthair cats only, even though the gene producing longhair Bengals has been around since the breed was started. This year, the Longhair Bengals have been accepted for Championship status in TICA, and have their own standard. 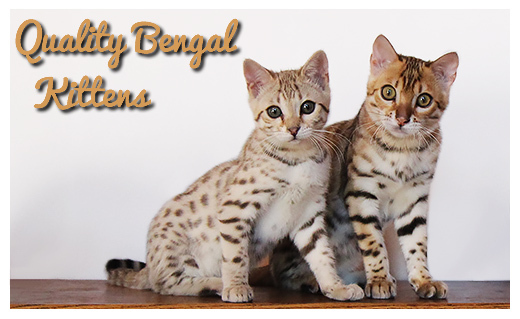 There are a few breeders in the Bengal Cat Directory that produce these beautiful cats, hopefully more will join! Comments Off on Bengals at Westminster! For those of you in the New York area, you can see Anthony Hutcherson (feline ambassador) and his gorgeous Bengal, Jungletrax Abiding Ovation, as well as more Bengals and other breeds of cats at “Meet the Breeds” being held in conjunction with the Westminster dog show Feb 11. Bengal Cats are finally being shown in Cat Fanciers Association (CFA) cat shows. Not yet in competition, but in the “miscellaneous” class. More information can be found on the CFA breed description page. For anyone with listings in the Bengal Cat Directory, CFA has been added to the registration associations list. Stand up for your Bengal Cats! Comments Off on Stand up for your Bengal Cats! Do not let extremist animal rights groups take away your ability to own hybrid breeds of cats such as Bengals, Savannahs and Chausies! If you own one of these breeds of cats, be aware that several states, including CA, are considering legislation against these breeds. 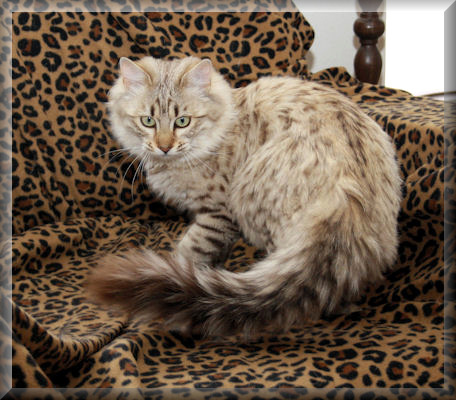 Please stand up for your right to own cat breeds with a exotic/domestic hybrid background. If owners of these cats are unaware of what is going on and do nothing to stop this legislation, your rights to own them may be taken away! Currently under consideration is the following CA petition by five organizations wishing to eliminate ALL ownership of cat breeds with a hybrid background. As you can see, only one of the participating organizations are even based in CA. They intend to start with CA laws and make them nationwide. Here is a link to a GREAT article by Marilyn Krieger – a feline trainer, behavioralist, rescuer, award-winning author, and contributor to online Cat Fancy magazine. She KNOWS her stuff! Included is information for contacting the CA authorities to voice your opinion. Comments Off on One year anniversary! Happy one year anniversary to The Bengal Cat Directory! To celebrate, check out special discounts for paid listings! All the information can be found on the add/edit listing page. Comments Off on Update for free listings! As of Nov 9, 2013, free listings will be ongoing, no need to renew each 3 months. YAY! Comments Off on Ready for new listings! The new and improved Bengal Cat Directory is now ready for new breeder listings! Check out the Add/Edit Listing button for details!